What Did It Take to Restore Dorothy's Ruby Slippers at the American History Museum? So How Do You Restore Dorothy's Ruby Slippers? There's no place like home — especially for Dorothy's ruby slippers. 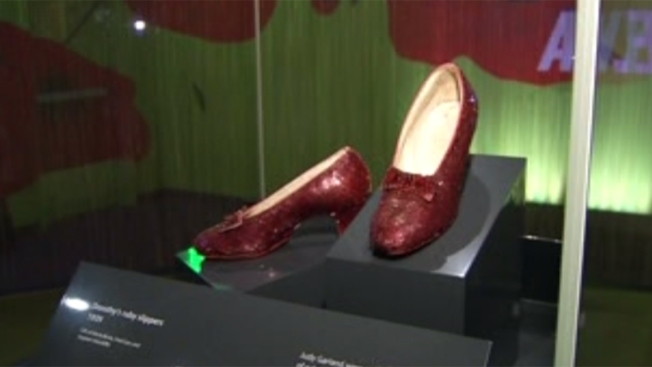 The iconic sequin-covered slippers from the 1939 film "The Wizard of Oz" will be back on display at the Smithsonian National Museum of American History Friday, the museum says. The size 5 shoes worn by actress Judy Garland were donated to the Smithsonian anonymously in 1979 after being sold at auction in 1970. During their time at the museum, the color on the shoes faded significantly from exposure to light and moisture, and some of the sequins lost their red plastic coating. The slippers were taken off display last year for some behind-the-curtain conservation work. Museum guests will be able to gaze at the sparkly red shoes Friday in the museum's newly renovated third floor West Wing in an exhibit called the "Ray Dolby Gateway to American Culture." The museum will hold a number of events this weekend to celebrate the return of the ruby slippers. Guests are encouraged to dress up in Oz-inspired costumes while they explore the new Ruby Slipper pop-up shop. The museum even plans to show the film, but tickets are required. The slippers will be on display with a number of pop culture artifacts, including DJ Steve Aoki’s turntable and a costume from "The Handmaid’s Tale." At least seven pairs of ruby slippers were made for "The Wizard of Oz," and four pairs are known to still exist. The Smithsonian's pair are mismatched. Each shoe has Garland's name scrawled on the inside. One is marked as "#1," the other as "#6." Until recently, the museum did not know where the match for either shoe was located. Last month, a pair that was stolen from the Judy Garland Museum in Grand Rapids, Minnesota, in 2005, was recovered. The stolen slippers' authenticity was verified by comparing them with the pair at the Smithsonian's Museum of American History, and conservators learned that the recovered shoes and the museum's shoes created two matching pairs. The museum says it doesn't know where the recovered slippers will go next. Two other pairs are owned by private collectors, including a pair purchased by Leonardo DiCaprio and Steven Spielberg for display at the Academy Museum of Motion Pictures.